Architecture, at its very best, celebrates life. It is a measure of joy in living, brought out through spaces which are evocative, spaces which are never static, constantly reflecting the inherent flux in nature. It is often a quest for simplicity and serendipity, qualities which are rare to articulate, qualities which then are overlooked for brash, loud interpretations and complexities. 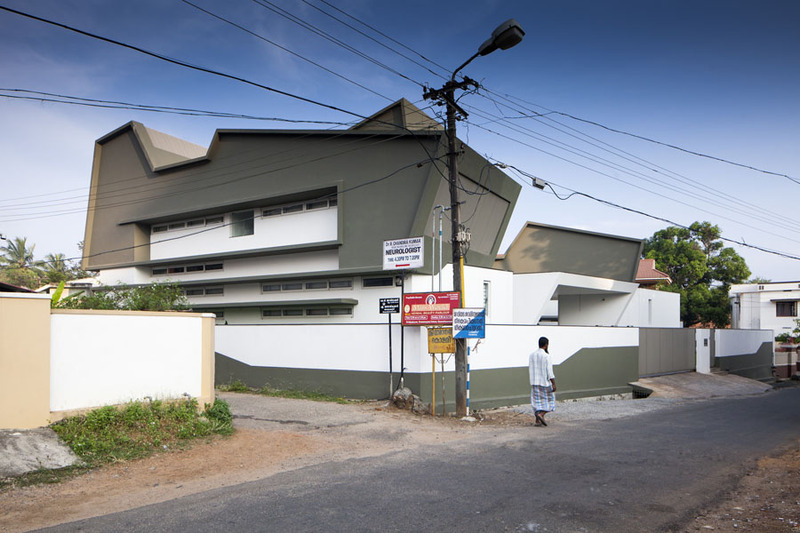 The ‘Skewed House’ by LIJO.RENY.architects is a true reflection of the power of architecture to create spaces which transcends mundane notions and trivialities to elevate and celebrate the sense of being. 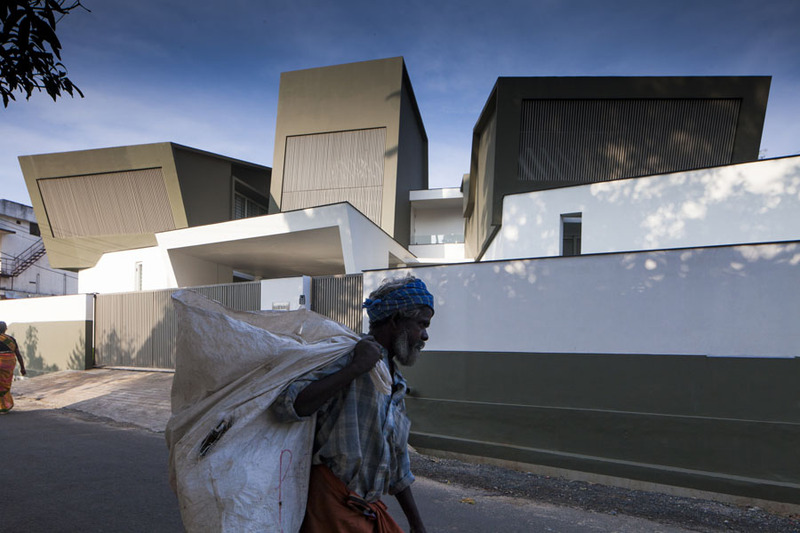 A skewed plot, set in a tight residential fabric in Palakkad, which is known for the blistering dry heat all year round and the powerful winds blowing across the opening in the Western Ghats, was the physical context which had to be addressed. The spatial manifestation of this evolved as a volumetric composition of spaces set against the alluring backdrop of the distant mountain range. This abstraction of the mountains when combined with the skewed nature of the plot, helped in deriving a vocabulary which was unapologetically contemporary in essence, yet, one which respected the immediate context and also one which was a reflection of the attitudes of the busy doctor couple and their two kids for whom the house was designed. 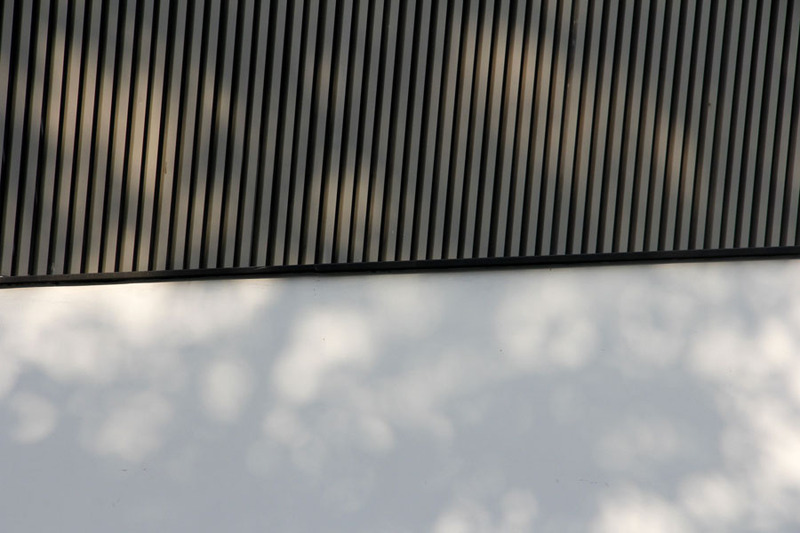 Strong lines and forms are juxtaposed on a visual plane, which perceptually evolves as one move forward. The approach is carefully orchestrated – the angular forms are very subtle at a distance, merging into the residential fabric of the by-lane almost un-perceptibly. These gradually rise up and reveal themselves as one move further towards the house, where, at a particular point the 3 dimensional abstractions of volumes are revealed perfectly against the mountainous backdrop. Scale then comes into play, there is a perceived sense of monumentality which is resolved into a more intimate scale by the careful juxtaposition of elements – it is at once monumental and yet, welcoming. 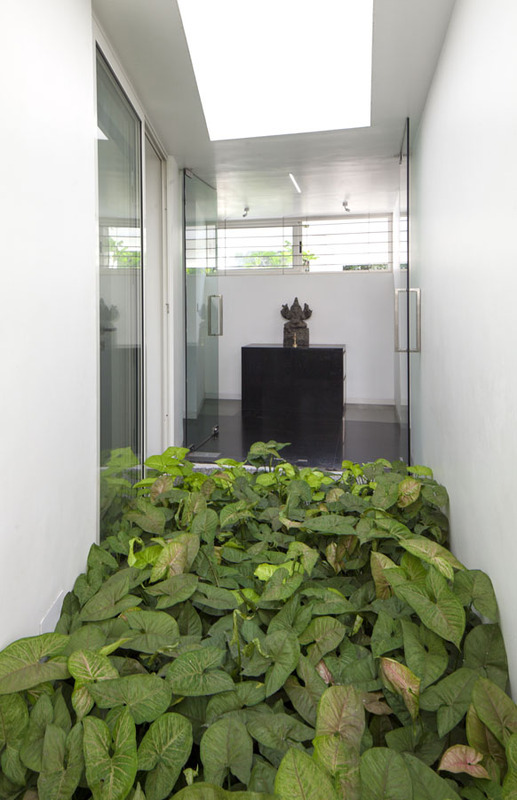 The entry sequence is informal, leading one past a small court with a frangipani, to a simplistic glass door enclosed foyer, which has a very open feel. 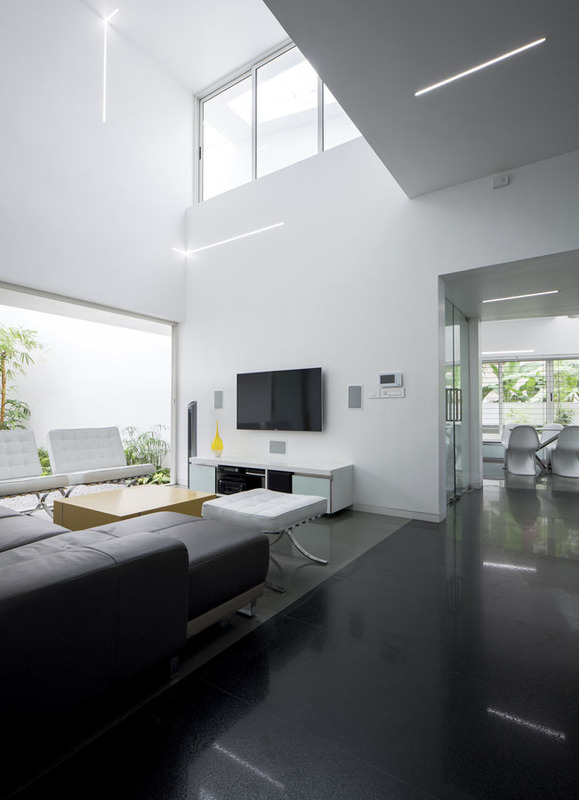 The formal living area is deliberately set off towards the outer periphery of the plot as a semi-public zone. 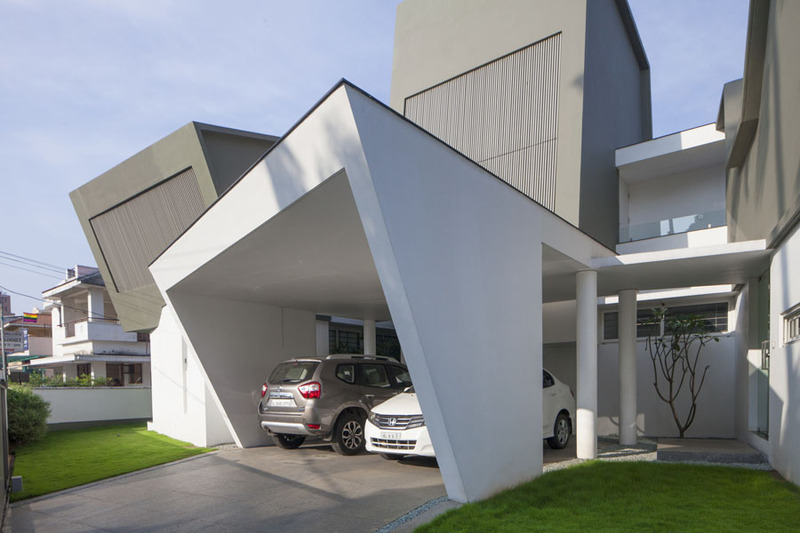 An angular open to sky court is defined by the external boundary wall, which opens up and bring in natural light and greenery to the pristine white formal living space. 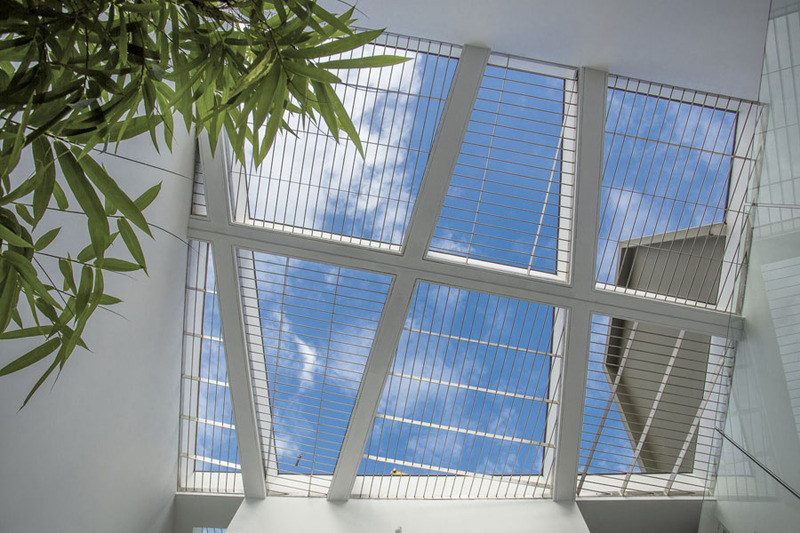 This space has a split level ceiling with a large opening to the east, which is carefully screened with a custom designed aluminium screen which lets in the beautiful morning light. The furnishings are minimal and contemporary – clean lines with white upholstery and a custom designed coffee table in white corian with SS inserts contrasting beautifully with the greenery of the open to sky court. The spaces of the house are juxtaposed as three principal bays which are layered with open spaces in between to address the microclimatic considerations, creating volumes which are bathed in natural light and ventilation. These bays are organized around an open to sky central court, which ensures a constant movement of air through the spaces all year round. The private zones of the house are a sequence of dynamic spatial compositions which open out onto variously scaled internal courtyards. Space and light form the basic elements which are articulated in a highly sculptural manner, enclosing volumes which are dynamic and transcendental. 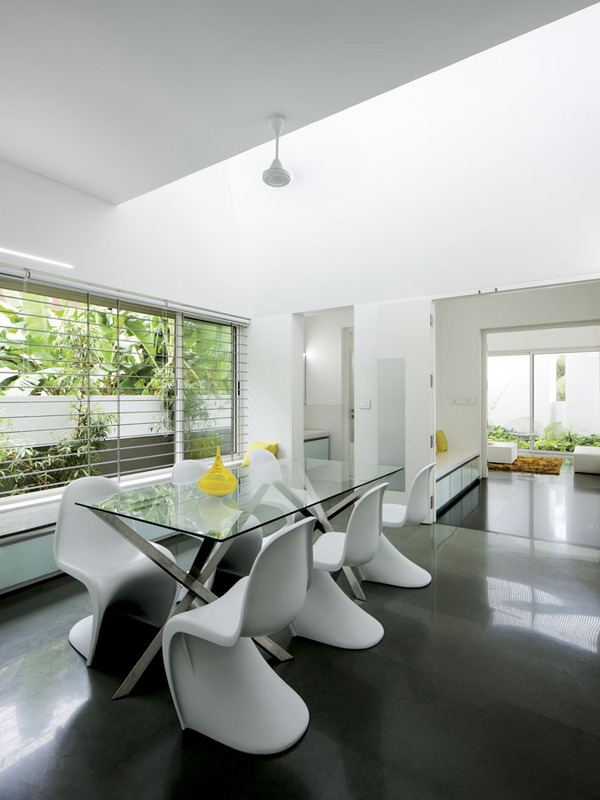 The dining space to which one enters from the foyer defines the entry to the private zones of the house. The space is simple, with one side defined by a very large window with an interesting built-in window seat – a comfortably proportioned platform looking out onto the dense greenery outside. 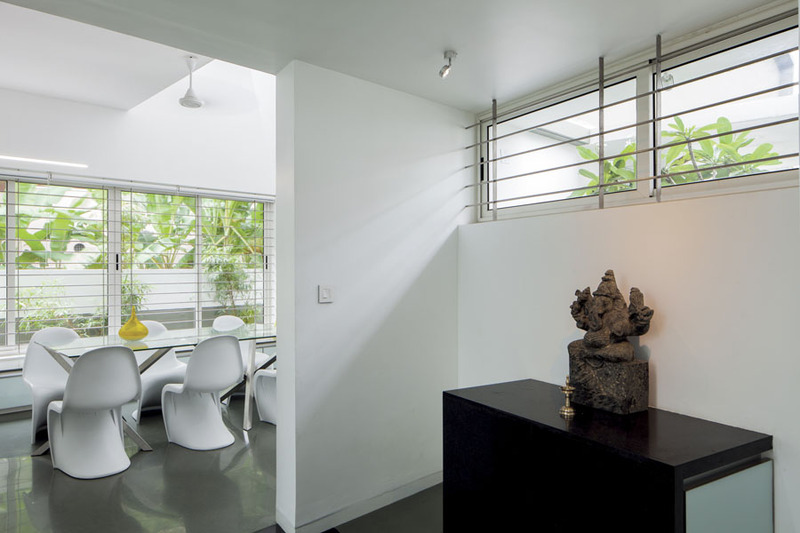 The space is made interesting by the split level ceiling with a large opening to the west, which is carefully screened with custom designed aluminium screens to catch the play of the evening sunlight. Beautiful breezes courses in through this space all day long, uplifting the ambience of the space. There is an interestingly designed dining table with a series of skewed legs in stainless steel, delicately balancing a glass top. This northern bay houses the foyer, the formal living area, the dining spaces, powder room, kitchen and related functional spaces like the store and work area. The buffer space between the northern and central bays of the house is a layer of landscaping which continues out onto the central open to sky court. Here, offsetted from the connecting passage is a monolithic block of granite, which defines the pooja space. 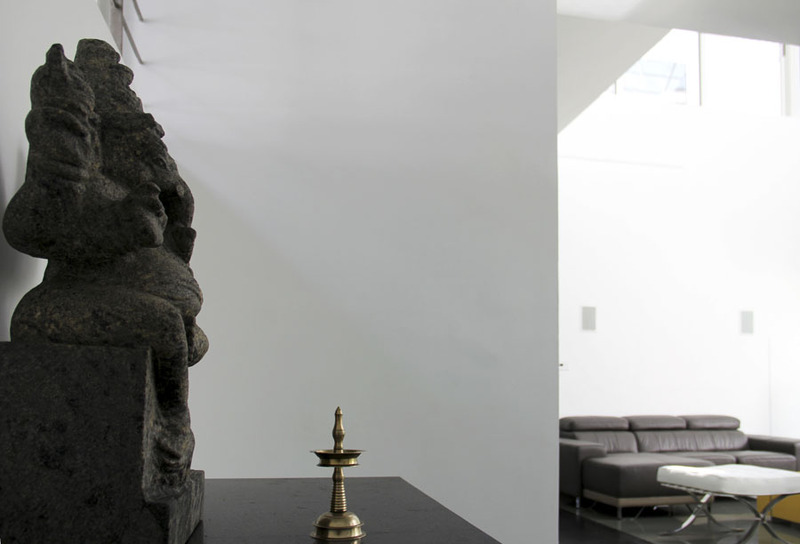 A simple Ganesha idol sits atop this monolithic pedestal. The black granite of the pedestal is continued on the floor, as an extension, out onto the open court in front. 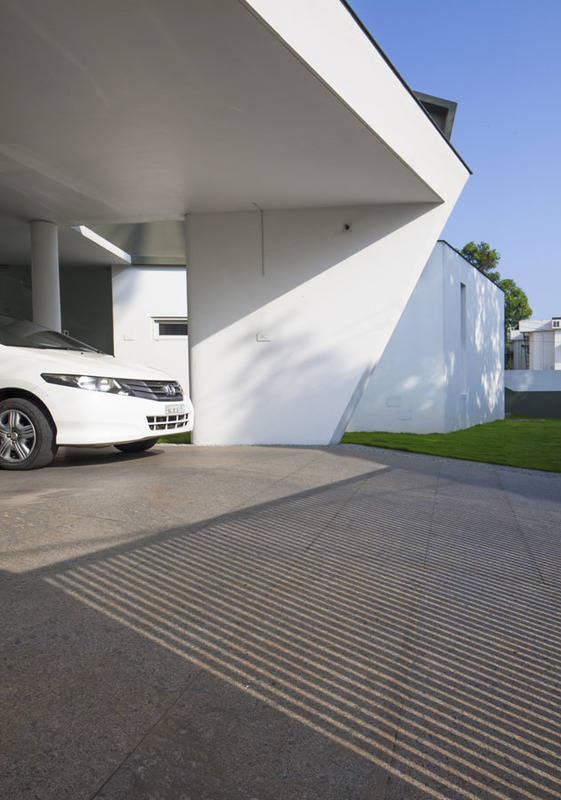 The monolithic block of granite is in fact an intelligently designed storage space in plywood, which is then clad with granite, for keeping materials like matchboxes, oil etc – little gestures, which elevate the functionality of the space. The central bay contains the dynamic family living space which opens out onto the vibrant open to sky court. The staircase and the upper bridge connecting the other two bays are oriented on the opposite side, towards the external car porch, creating a buffer on the external side. The double heighted informal living space forms the heart of the composition and extends out onto a stimulating open to sky court. 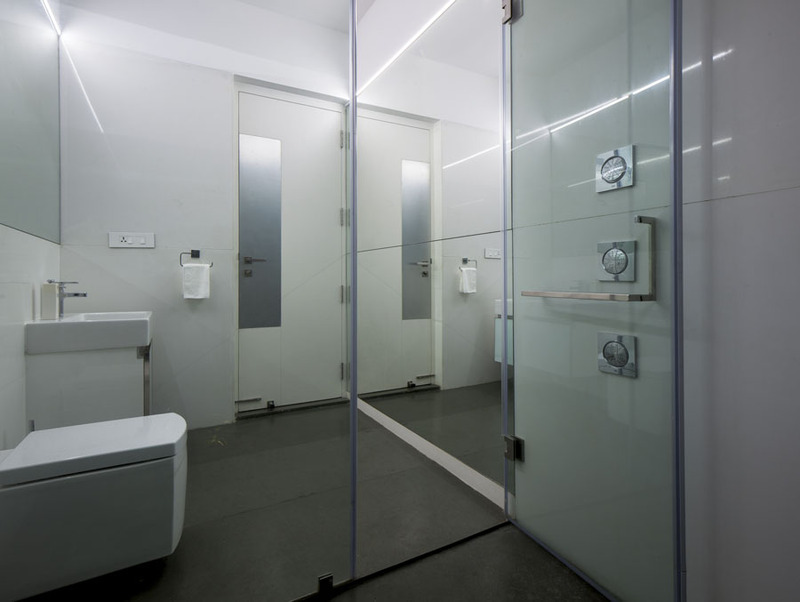 This space is deliberately offsetted from the entry bay to increase the privacy. 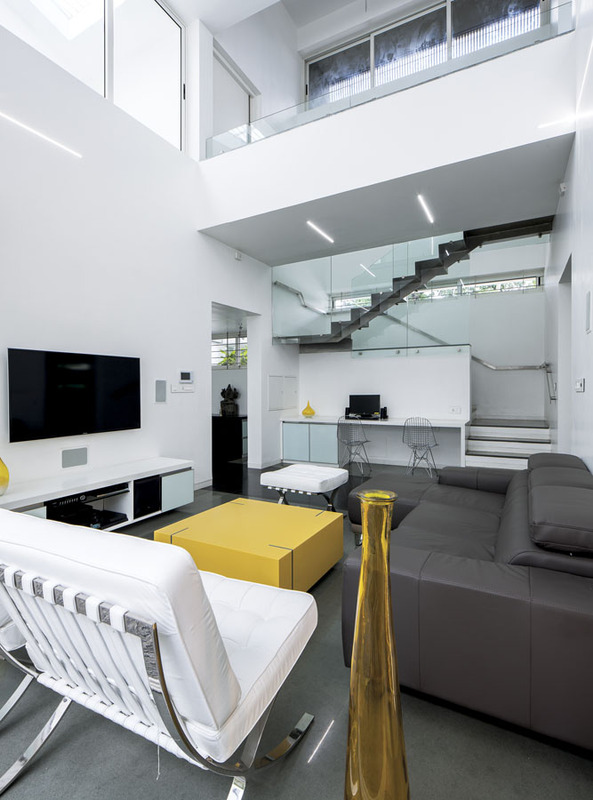 White Barcelona chairs are contrasted with a vibrant yellow coffee table finished in Corian and a custom designed TV console, adding a touch of delicate sophistication. 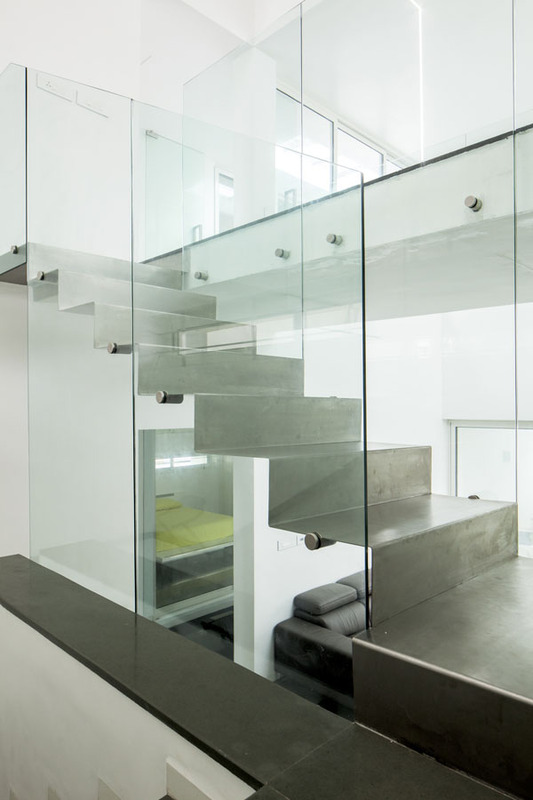 One of the main elements of the house is the interestingly detailed out staircase, an interplay between the solidity and permanence of the Kota stone finished lower portion of the stair and the ethereal lightness of the suspended stainless steel upper flight of stairs. The 3mm thick SS plates fold around minimalistically to create a delicately precise flight, which when combined with the ceiling suspended glass railings, create an illusion of floating in space. 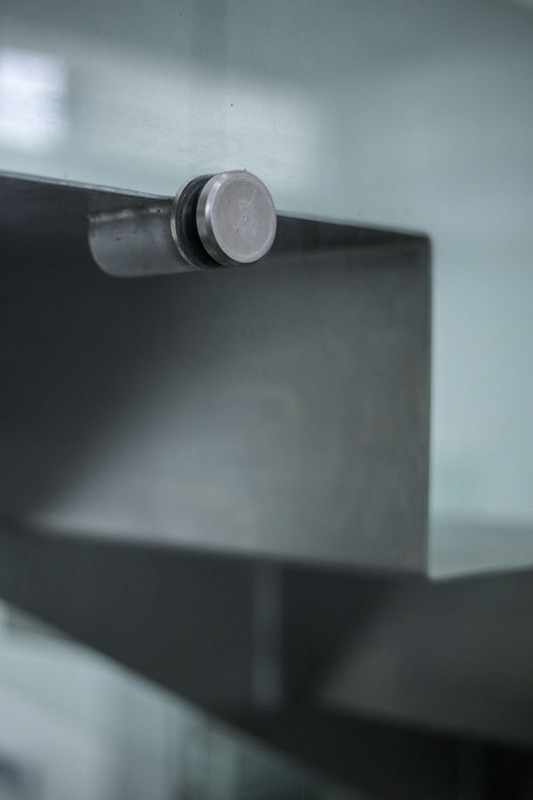 Sound further adds another tactile dimension to the space through variations created by changes in the material – the lightness of the footfall on steel contrasted with the solidity of stone treads. The southern bay houses the bedrooms and the toilets on both the floors and is buffered from the central zone by a layer of covered open space. The masterbed on the ground floor features a set of fully openable sliding doors which define the transparent front plane which further opens out onto the central court through an intimate private patio. This covered patio serves as the spill out space for the bedroom and also houses a small workout area, one which is set amidst the clean open greenery for a rejuvenating experience. The southern side of the master bedroom is defined by layers of narrow horizontal slit windows which run through the entire length of the wall. These linear fenestrations keep out the harsh southern sun while allowing plenty of natural ventilation inside the bedroom and further ensure privacy from the dense residential fabric on the southern side. 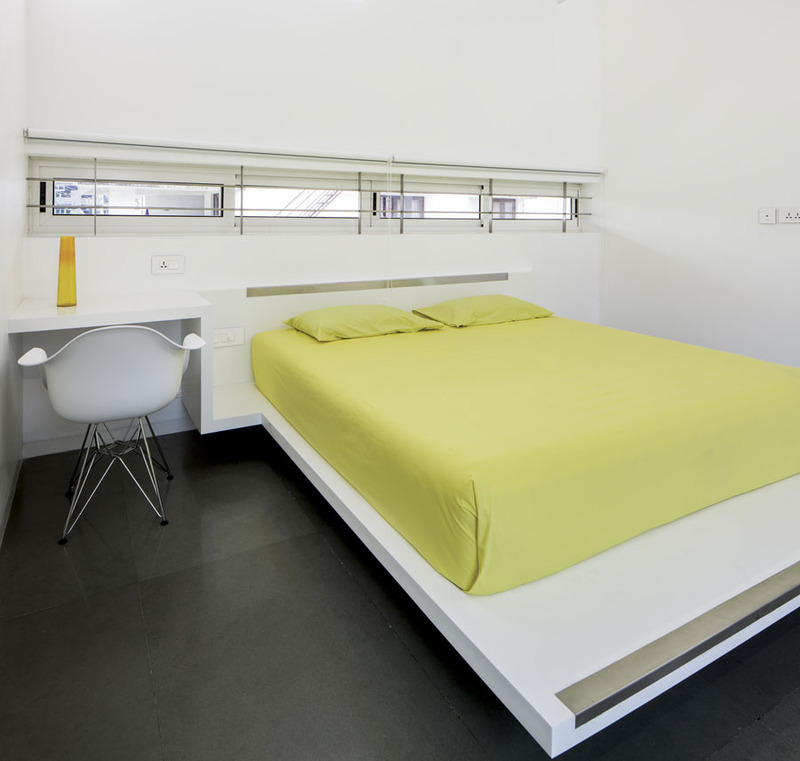 All the bedrooms feature built-in cots finished in white corian and detailed out with neat SS trims, creating floating platforms. The house is deliberately introverted, as a response to the need for privacy in a dense neighborhood fabric, and also as a climatic gesture, to provide refuge from the high temperatures prevalent throughout the year. The spaces unabashedly open out onto internal courtyards which become the loci of the composition, creating a sense of continuity from the inside to the outside. 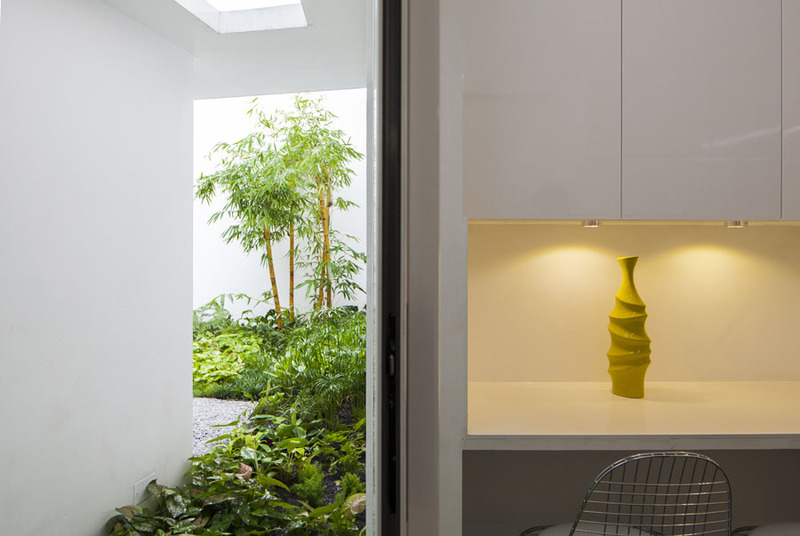 These open volumes are integral to the conception of this house and form the ever present backdrop to all the spaces, with the landscaping adding vibrancy and life to the ambience and also aiding in the microclimatic control of the space, resulting in a beautifully ventilated space, which is much cooler than the outside temperatures. Volumes are manipulated and spaces sculpted to modulate the spatial experience in each area. 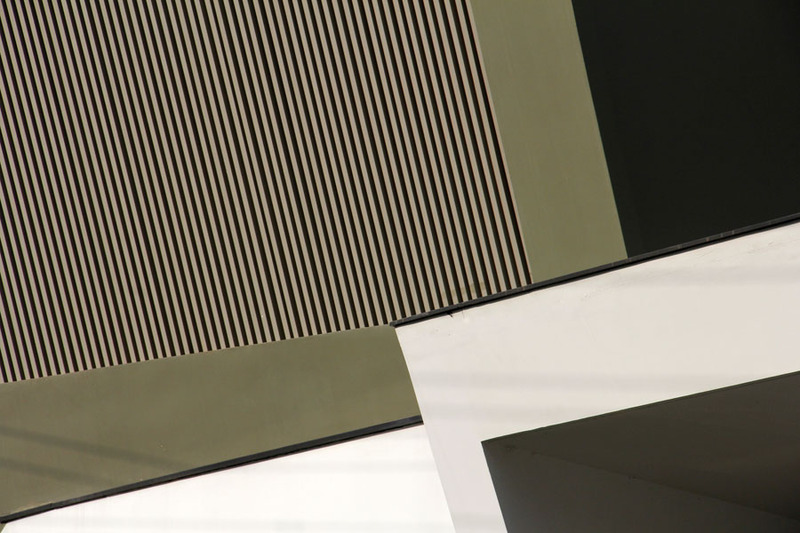 Thus there are careful variations in heights and volumes, creating subtle transitions from a low height intimate passage which opens out onto double height volumes, amplifying the psychological impression that this sequencing generates. This, combined with the careful placement of windows on the double height, allowing beautiful natural light to filter in to the spaces, creates a very uplifting spatiality which keeps varying with the different moods of the day. Light as an element is orchestrated in a highly restrained manner, creating spaces where sometimes the light filters in indirectly along a double height wall, while sometimes; there is an explosion of natural light which is focused directly onto a wall which forms a screen for the magnificent choreography of emotions to play out. The fourth element of time is manifested in the changing moods of the day which are projected onto the various walls through carefully orchestrated openings. 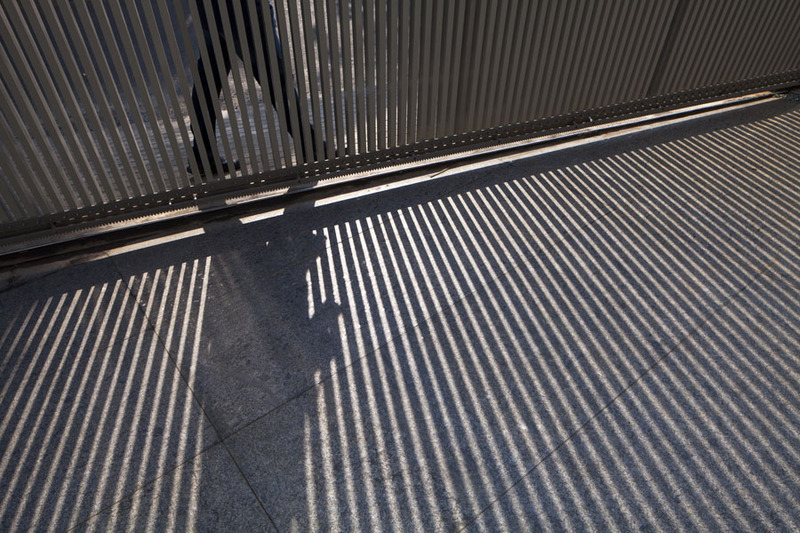 Patterns add another dimension to this manipulation of light. Patterns from the overhead grills are in a perpetual state of fluidity, adding a dash of dynamism to the pristine spaces. It is almost as if the planes of the house form a backdrop for the beauty of nature, in its inherent variations, be amplified onto. 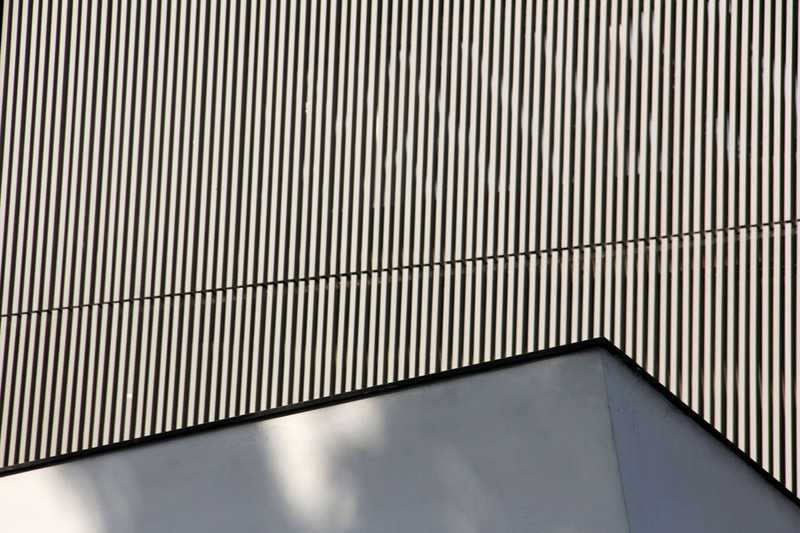 The SS grill on top of the open courtyard has been detailed out to catch the strong sun, projecting beautiful abstract patterns onto the wall planes. The dynamism is brought in by the constant variations created by the varying sun paths. The spaces are well detailed out with careful consideration paid to the minutest element. 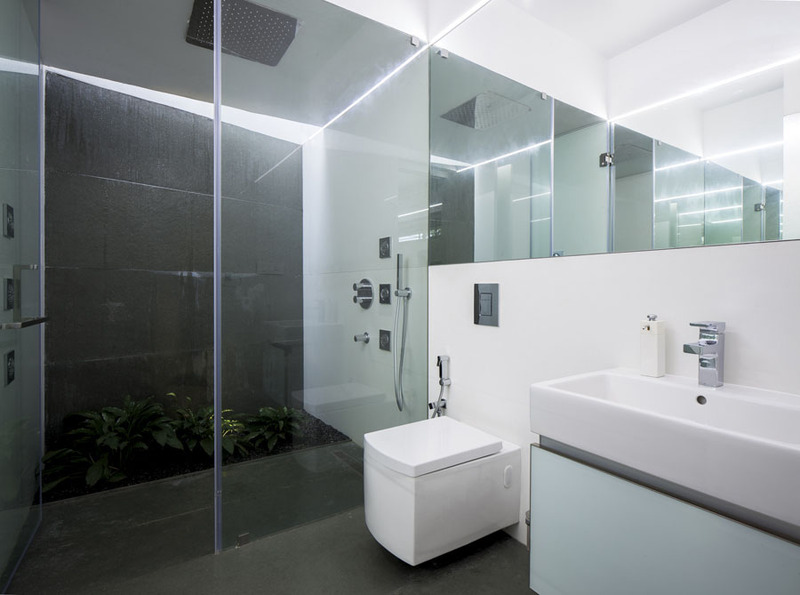 The understanding that even subtle variations can have a huge impact on the spatial and tactile quality has influenced the design process to address each and every aspect of the space. 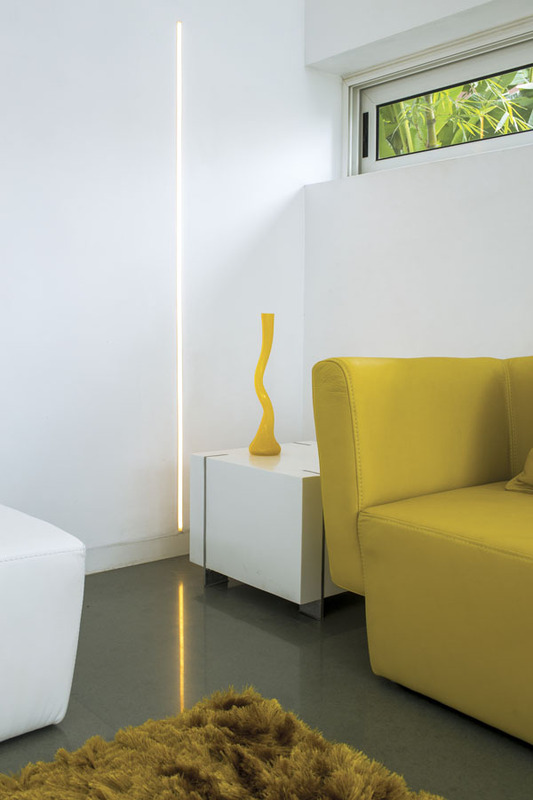 The relatively minimalistic colour schemes and design sensibility are made interesting through small gestures – the interestingly designed light fixtures, concealed linear LED strips inserted into the walls, continuing from the walls to the ceilings, dashes of yellow as an accent colour which contrasts beautifully with the white, all adding additional layers to the spatial ambience. 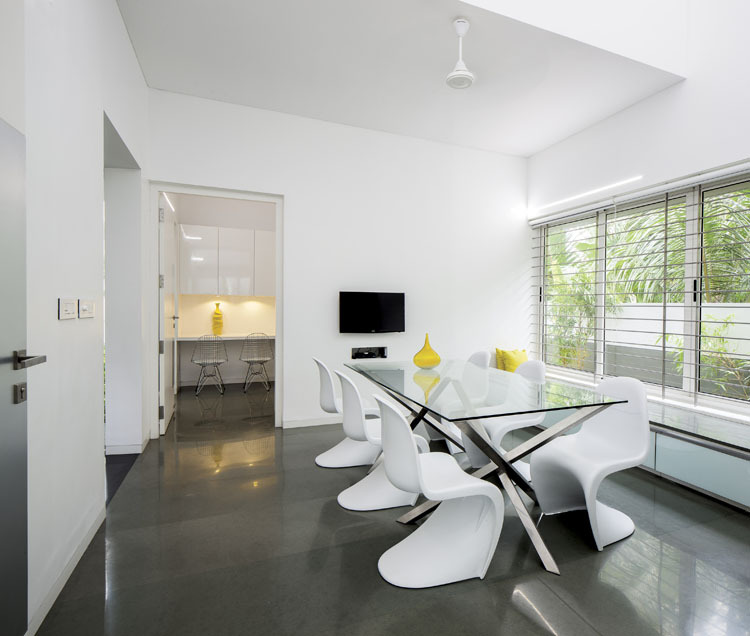 Minimalistically detailed furniture further enlivens the quality of the space & ambience. 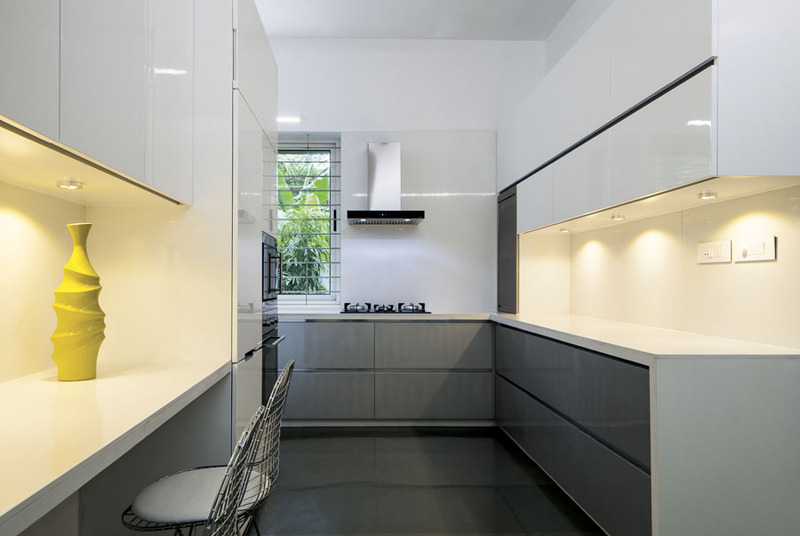 Neat clean lines define contemporary aesthetic sensibilities, which run as a unifying theme through the interiors. Yet, the level of attention to detail is evident if one observes the little intricacies and care with which each element is put together, to create the beautiful minimalistic vocabulary. The functional and conceptual clarity of the design, articulated through a well defined aesthetic sensibility creates spaces which are dynamic and beautiful; one which is never static but is evolving constantly. Simple clean lines, volumetric variations, beautifully refined colour schemes, attention to detail and the close integration of interiors and exteriors, all combine to create a highly refined and beautiful space, one which is a joy to live in.